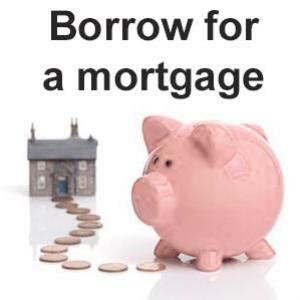 How much can i afford to borrow for a mortgage? Buying a home is a big decision. Most people who buy a home will use a combination of savings and a mortgage. Buying a home is a big decision. The amount you are willing to pay and how you’re going to pay for the home is something that needs to be thought through carefully. Most people who buy a home will use a combination of savings and a mortgage. Before beginning the search for a home they need to know how much home they can actually afford to buy, taking into consideration the amount of savings they have on hand. This will help them to know the mortgage amount for which they must qualify. That may sound difficult, but it can be completed by following a few simple steps. When it comes to things to know before getting a mortgage, at the top of the list is learning the difference between the amount of mortgage for which you qualify and the amount you can afford. They are often very different numbers. Before you start looking for a home, it is a good idea to get pre-qualified for a mortgage. This means that a bank has looked at some basic information, such as income and determined how large a loan you should be able to get when you apply for a mortgage. That number will help you decide how much you can afford to pay for a home. Before you go to get prequalified, it is a good idea to review your credit rating. It could be a good idea to wait a little while and try to improve your score. There are often little things that you can do that will quickly raise your credit score and make it easier to pre-qualify for a mortgage. You may be wondering, How much can I afford for a mortgage? A bank may qualify you for a certain amount, but that does not mean you can afford that mortgage. It is a good idea to figure out exactly how much mortgage you can afford based on your income, bills, and the lifestyle that you want to lead. Make sure that you have enough money in your budget to repay the mortgage. One thing that could help when you are deciding how much you can afford, is to order your credit score. A good credit score (over 720) may help you get a better interest rate on your mortgage. That lower interest rate will lower the amount you have to pay monthly. It means that you might be able to afford a larger mortgage. Different types of mortgages As you are learning about mortgages, you will find that there are many different types. This can impact the amount of mortgage that you might afford. Consider the different types of mortgages and how they impact your budget. • 15 year vs. 30 year mortgages- The amount of time over which your mortgage is spread out may impact the amount you have to pay every month. A 15 year mortgage will have a lower interest rate and will help you pay off your home faster than a 30 year mortgage, but it usually means a higher monthly payment. • FHA and conventional mortgages- FHA mortgages are backed by the government. They are used by buyers who meet certain standards. FHA loans require a buyer to have a down payment of only 3.5 percent. Conventional loans require as much as 20% down to purchase a home. • Other expenses that come with a mortgage- A monthly mortgage usually includes the payments for homeowner’s insurance, property taxes, and other fees that are required to be paid for by the homeowner. Do not forget to include these costs when thinking about how much you can afford to pay every month. • Private Mortgage Insurance (PMI)- If you put less than 20% down on a home, you will usually have to pay for this insurance until you have paid 20% of the value of the home. This can add more expense that needs to be considered. Make sure that you take the time to determine how much mortgage you can afford before you commit to buying the home of your dreams. You do not want to end up having a home that costs too much or one that causes financial problems for you. It is better to have a home that you are happy with both emotionally and financially.